"Can't decide between cookies and confections? You don't have to! 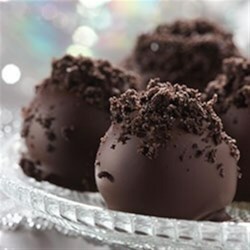 These chocolate-covered cookie balls feature a filling of cream cheese and crushed cookies." Snowmen OREO Cookie Balls: Give your OREO Cookie Balls variety by decorating them as snowmen. Substitute white chocolate for the semi-sweet chocolate and decorate with a snowman face using decorating gels and frostings. Christmas Tree OREO Cookie Balls: Get in the holiday spirit by decorating the OREO Cookie Balls as Christmas Trees. Substitute white chocolate for the semi-sweet chocolate and decorate with a Christmas tree design using decorating frosting and a cinnamon candy on the top. For Easier Dipping: Use a toothpick to dip the cookie ball into melted chocolate; shake off excess chocolate then place on waxed-paper. This may leave just a small hole on top that can be covered with a tiny dab of chocolate. Gift-Giving: Pack these delicious cookie balls in small containers. Then, add a colorful bow and gift tag to each container and you've got the perfect holiday or hostess gift. Nutrition Information Per Serving: 100 calories, 6g total fat, 3.5g saturated fat, 5mg cholesterol, 55mg sodium, 12g carbohydrate, less than 1g dietary fiber, 8g sugars, 1g protein. Made these with white chocolate instead of semi-sweet for dipping. They were delicious - everyone asked for the recipe. This recipe wil be used ver and over again in my family! These are really really yummy! Love this recipe!!! I found that placing the balls in the freezer for about 20 minutes makes it much easier to dip this in the chocolate. This was a big hit with my family!